We meet Brainwyrm, Mind2 and Abbakus as they collect cities from across the star systems in the past. On Planet Noma in the present, however, is where the action takes place as Pneuminoid a clockwork droid takes the planet prisoner and captures his inventor, Noma's leading scientist, Victoria Viceroy. Viceroy, questions her captive and once loyal droid. He points out her misconception that he is destroying Noma as actually trying to save it. If he is to stop the Multitude he must succeed and Pneuminoid begins explaining how it all began years before on Yod-Colu. Here in a laboratory a determined scientist coldly experiments with the aid of his AI assistant C.O.M.P.U.T.O. He is Vril Dox and his test subject, his son. When his wife Lysl stumbles upon an experiment that is torturing their son she immediately cuts off contact and reports him to the authorities. Emotionless, Vril was forced in front of an elder council and made to explain his crimes against Yod-Colu and his family. Vril presented a fair case, he had discovered a force from the 5th Dimension called the Multitude that was systematically destroying planets. The only chance to survive is for the Coluans to evolve and upgrade their species. His son proved a perfect test subject. He offers to continue his research if they can find him a volunteer. The Coluans instead find him guilty and launch him off planet in an exile ship. The ship is designed to strand its captive on a planet far away from home with no way back. Vril was the designer of the ship and so, using a hidden code word, he overwrites the ships AI with C.O.M.P.U.T.O and begins upgrading himself and the ship with tech to survive. Vril returns home and via a holographic transmission he informs the citizens that he has downloaded all valuable planetary information and Terminauts will preserve any physical artifacts before destruction. With the Multitude about to arrive almost instantly, Vril shrinks the city his former wife and son reside in. That is how it began. Then in time Vril fashioned vessels for his intelligence. Facsimile clones of each species to carry on his work. Each was Vril but none looked the same. They were Brainwyrm, Mind2 and Abbakus but the tale took a distinct turn when one of the vessels approached Krypton. Dubbed Brainiac by Kryptonians Vril found a kindred spirit in Jor-El, they had very many similarities and had the circumstances been different it was possible they might have worked together. Brainiac shrank and stole Kandor but as he departed he looked back to see Jor-El achieving something Brainiac had found impossible. He turned the Multitude away leaving Krypton unharmed. By the time Brainiac had steered his craft back forces of nature destroyed the planet killing any chance of Brainiac ever discovering his secrets. In the present, Victoria only believes part of Brainiac's story, in part due to Pneuminoid's built-in lie detector. She points out the bottle cities were trophies not samples of societies across space and time. Victoria activates cameras in her lab just as Brainiac arrives in person. Brainiac reveals that if a planet doesn't prove useful in his quest to destroy the multitude, he destroys the planet himself, long before the Multitude even arrives. Brainiac records the planet knowledge and miniaturizes the city. As he teleports away, Victoria refuses to die with Brainiac's secrets lost and orders her computer to transmit the recording out of Noma's light year vicinity. Noma promptly explodes as a cold collector watches on. On Earth in The Block, Dr. Shay Veritas receives the transmission and promptly tries to locate the source while having her equipment decipher Noma's alien language. Her computer explains that Noma is gone, long dead. But as Veritas listens she hears Brainiac's confession that he is the destroyer of world's if they refuse to cooperate with him. Story - 4: As with the Bizarro story, a new twist is thrown in. It nicely explains Brainiac's already ever changing appearance in the New 52 and makes it familiar enough with past iterations that it's not a completely alien concept. The parallels with Jor-El were intriguing, despite not knowing what was truth and what was a lie. I liked the confession and look forward to that playing out with H'El and his motivations. Tony Bedard proves he can make a stale story fresh and interesting. So far, my favorite Forever Evil tie-in. Art - 5: So different from Superman's monthly offerings I was ready to hate it but I honestly couldn't. It's a beautifully illustrated chapter. The style gave a degree of realism and believability to the story that otherwise wouldn't have worked so well. Cover Art - 3: It's not the 3D I promise. This cover just didn't seem that great. 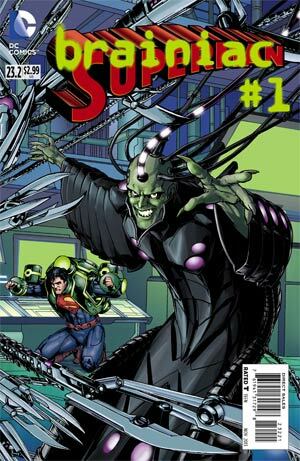 At first I thought this was the combined Lex/Brainiac team, the story inside made great pains to convey a cold emotionless Vril Dox, the cover just throws it out the window, especially with the maniacal grin. Was I also the only one to be reminded of Mr. Smith in the Lost In Space movie?